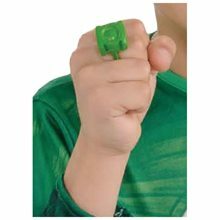 Green Lantern Light Up Child Ring;Child size light up Green Lantern ring to complete his Green Lantern superhero costume. Show your allegiance to the Green Lantern Corps with this Green Lantern child's light-up power ring. Great for parties, plays/theater, and Halloween. Green Lantern Inflatable Fist.Includes: One Green Lantern Inflatable Fist. *Costume and Accessories Not Included. Sold Separately. Show the universe you mean business when you add the Green Lantern inflatable fist to your costume! This accessory is made of vinyl and features dark green fist details. 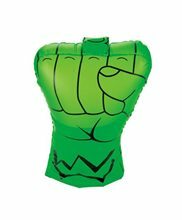 Raise your fist for justice this Halloween with the Hal Jordan Green Lantern inflatable fist costume accessory! 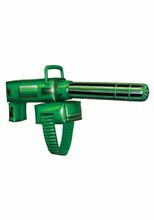 Green Lantern Inflatable Gatling Gun .Includes: One Green Lantern Inflatable Gatling Gun. *Costume and Accessories Not Included. Sold Separately. A Gatling gun is a rapid fire automatic weapon that can be shoulder mounted. This Green Lantern Inflatable Gatling Gun. The details of the gun are printed on this super light prop that makes a great addition to a child's Green Lantern costume. Green Lantern Muscle Deluxe Plus Size Costume.Includes: One green and black muscle chest jumpsuit with crest logo on chest, attached shoe covers, green eye mask that secures around the head with an elastic strap and a green power ring. Available Size: Mens - Plus Size. (See Size Chart For More Information) *Shoes Not Included. Accessories Sold Separately. Embrace your superhero tendencies as a Green Lantern Corps member in our Deluxe Hal Jordan Plus Size Costume. Our uniform for the big and tall will transform you into the founding member of the Justice League of America. Our Green Lantern Deluxe Hal Jordan Plus Size Costume includes a green and black muscle chest jumpsuit with crest logo on chest, attached shoe covers, green eye mask that secures around the head with an elastic strap and a green power ring. Green Lantern Muscle Deluxe Toddler/Child Costume.Includes: One green muscle chest jumpsuit with crest logo printed on chest, attached shoe covers, green eyemask that secures around head with elastic strap and a green power ring Available Size: Toddler, Child - Small, Child - Medium, Child - Large. (See Size Chart For More Information) *Shoes Not Included. Accessories Sold Separately. Boys will transform into a superhero known as Green Lantern with our deluxe Hal Jordan Child costume. Your little superhero will protect peace as a founding member of the Justice League of America with the Green Lantern Corps. Our deluxe Green Lantern Hal Jordan Child Costume includes a green muscle chest jumpsuit with crest logo printed on chest, attached shoe covers, green eyemask that secures around head with elastic strap and a green power ring. Green Lantern Light-Up Sword.Includes: One Green Lantern Light-Up Sword. Dimensions: Approximately 26" Long. *Costume Not Included. Accessories Sold Separately. WARNING!! : Not intended for use in play by children under 6 years of age.Part of the Green Lantern Corps, you will need certain tools to help you as a protector of peace. Use our Green Lantern Light-Up Energy Sword toy as an accessory prop to your Hal Jordan costume for an authentic superhero look. The Green Lantern toy sword will light-up a vibrant green when activated. This Green Lantern Light-Up Energy Sword toy prop is a great accessory to add to your Hal Jordan costume and is great for kids' pretend play dress-up! Requires 2 "AAA" Batteries. Batteries Included.Made in China.